Our Sea Cadet program builds leaders. The NSCC is the senior program of the US Naval Sea Cadet Corps. It was developed for older cadets, ages 13 through 17. The mission of the NSCC is to expose cadets to the full rigors of a military training program. NSCC prepares its cadets for whatever path they may take after high school. I'm 13-years-old. Should I join the NLCC or the NSCC? While NLCC cadets can go into the NSCC when they turn 13, they may also elect to remain in the NLCC until age 14, when they must either transfer into the NSCC, or leave the program. If you are 13, and going to turn 14 within the calendar year, it is recommended that you start in NSCC. I'm 17-years-old. Can I join NSCC? You can join the NSCC as long as you have not yet reached your 18th birthday. If motivated enrolled cadets turn 18 before graduating from high school, a waiver can be requested for continued enrollment until the completion of high school and summer training of their graduation year as long as they are a member in good standing. What types of training can I participate in as a Sea Cadet? 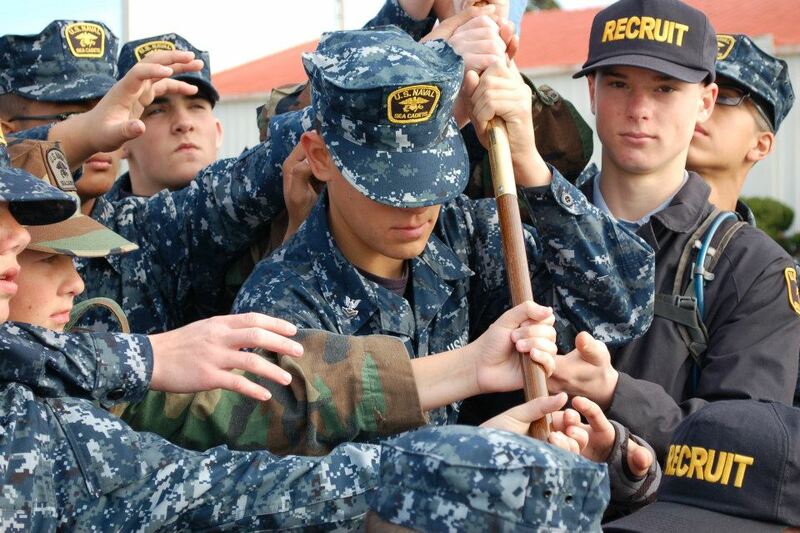 After enrolling in the program, all Sea Cadets must attend a mandatory two-week recruit training session. These training sessions are taught all-around the country. The curriculum of this training is approved by the U.S. Navy and standardized at all training sites. Cadets receive 106 hours of instruction with a focus on the Navy's core values of honor, courage and commitment. After successful graduation from recruit training, Sea Cadets may choose from a wide variety of advanced training opportunities. You can read more about cadet training here. Are Sea Cadets permitted to go to sea? Absolutely! After completing recruit training and other required courses of instruction, Sea Cadets can participate in two-week advanced training abroad Navy and Coast Guard vessels ranging from small patrol craft to large nuclear powered aircraft carriers. Do I need to buy my own uniform? Surplus U.S. Navy uniforms are made available to the Naval Sea Cadet Corps. These uniforms, in turn, are made available to cadets at a minimal cost for handling and shipping. Uniform needs that cannot be met through this source may be purchased at Navy Exchange Uniform Shops. What are the main differences in training between the NLCC and the NSCC? The training program designed for League Cadets is age-appropriate and less rigorous than that of the NSCC. When joining the NSCC, cadets are required to have attended a two-week away-from-home recruit training in order to rise in rank and participate in advanced training sessions. Navy League Cadets have the option to attend a one-week, away-from-home orientation, but it is not a requirement for rank advancement or advanced training opportunities. NLCC training events are shorter in length than NSCC training events. NLCC events typically run for seven to nine day periods, unlike NSCC training rotations which can last for two weeks or longer. What is the rank system for NSCC cadets? The rank system for cadets is as follows: Seaman Recruit (E-1), Seaman Apprentice (E-2), Seaman (E-3), Petty Officer Third Class (PO3), Petty Officer Second Class (PO2), Petty Officer First Class (PO1) and Chief Petty Officer (CPO). Promotions are made by time--in-rate requirement and passing of examinations.